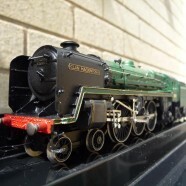 A Project started before the Hornby Clans were in the shops – using an old Jackson Evans conversion kit on a Triang Britannia. All wheels were replaced for later metal tyred ones, motion taken from a 9F and motor replaced for an Airfix 5 pole equivalent. 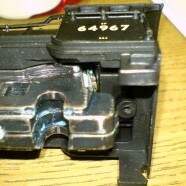 The smoke unit still works under DCC control, driven from the full DCC track voltage via a relay off Function 1.